St Clair is a bustling beachside suburb of Dunedin with a selection of beautiful cafes and restaurants located along the St Clair Esplanade. The beach is rated as one of New Zealand's best for surfing and offers something for anyone with an affinity for the ocean. 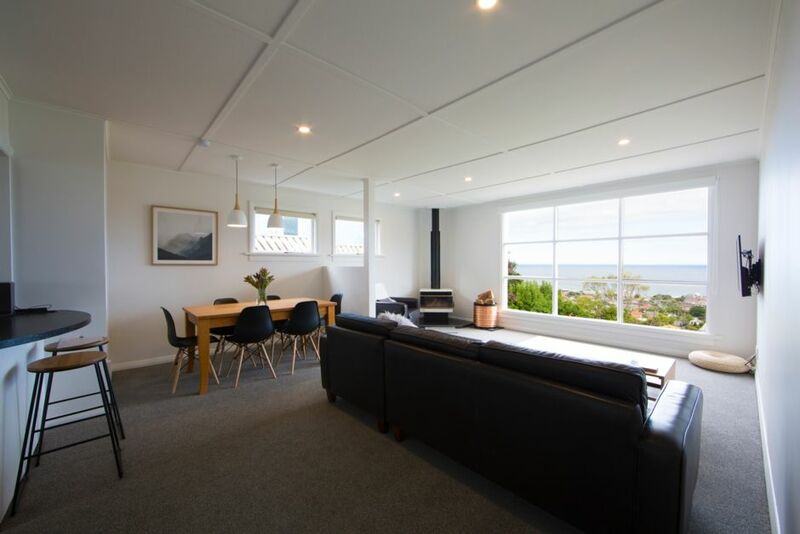 The Eagle's Nest is within walking distance of the beachfront, just a 10-minute drive from the Octagon (Dunedin city centre), 10 minutes from Forsyth Barr Stadium, and in close proximity to St Clair Golf Course and Chisolm Links Golf Course near St Kilda Beach. The famous wildlife attractions of the Otago Peninsula are close by with yellow-eyed penguins, albatross, sea lions, seals and bountiful birdlife within easy reach. The Eagle's Nest is a warm and comfortable open-plan beach house that offers space for entertaining and relaxing. Heated by a wood burner and heat pump, you'll always be toasty as you take in the sweeping vista from the lounge, master bedroom and sunroom. Furnished in a fresh and contemporary style, The Eagle's Nest is well-suited to couples looking for a spacious stay right through to families wanting to sprawl out. The modern kitchen has everything you'll need to enjoy your stay and the all-new bathroom is warm and cosy. The house also features a fully equipped laundry and second toilet. We pride ourselves in our attention to detail, cleanliness and those nice touches that make your stay special. Weekly rentals are available – please contact us for details and pricing. Please also note that higher rates may apply when there is a special event in town or during public holidays – please contact us for details. Wonderful house, amazing views, loved it !! Very spacious house, everything that we needed had been provided. Amazing views. Short drive to beautiful beach and great bars and restaurants. It was a great place to stay to end our 6 week tour of New Zealand. This beautiful home has such inspiring and stunning views, it was so wonderful walking in and and taking in the view, and joy to see each day. The house is well appointed, spotlessly clean, and wonderful in every way. Thoroughly enjoyed our time here. Comfortable ocean view home in a great St. Clair location. This well equipped house is on a quiet street overlooking the beaches of South Dunedin. Close proximity to several good local surfing spots and downtown. We had a wonderful time staying here while attending a recent family wedding and would stay here again on our next visit to Dunedin. We had 7 adults stay as we were in town for a wedding. The home was spacious, comfortable and immaculate. It had all the necessities in the kitchen and other homely touches around the home. Would absolutely stay again. Also the views are amazing!